We're sharing tips and tricks that make navigating all of our kitchens easier and more fun. 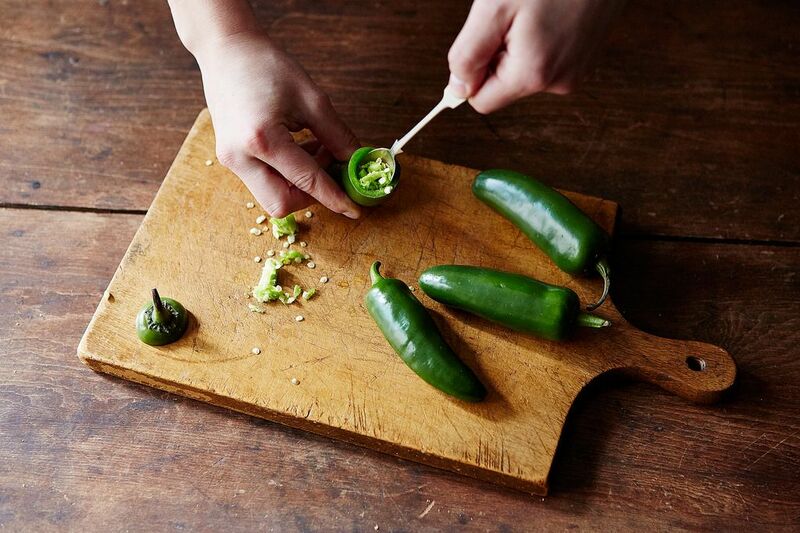 Today: A fuss-free way to remove the seeds from hot peppers without hurting yourself. 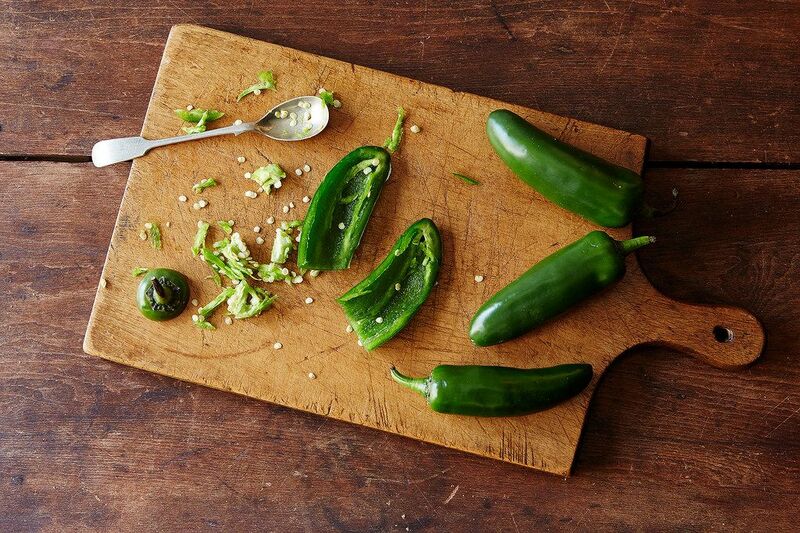 I inadvertently wince each time I even read a recipe that calls for removing the seeds from jalapeños or habaneros. 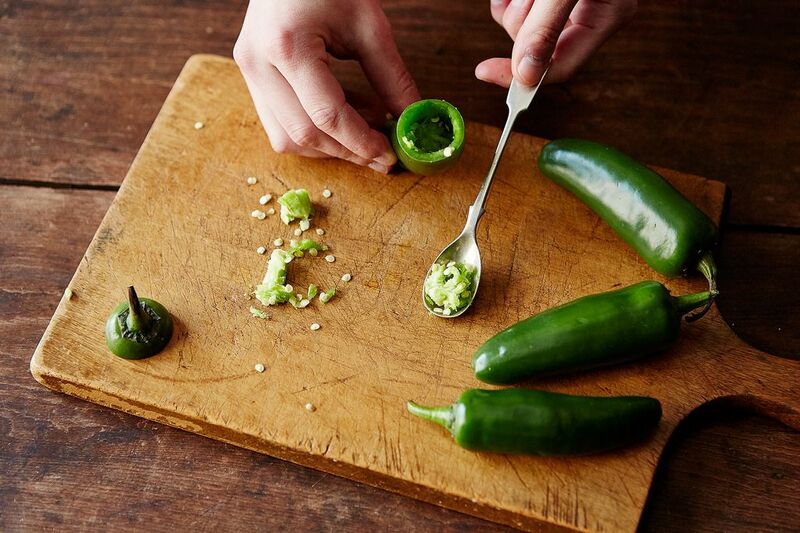 Handling hot peppers can be scary stuff—especially if you're trying to get rid of the super-spicy membranes and seeds. One misstep and you'll end up soaking your hands (or your face) in milk when you really should be enjoying pad thai. Most techniques for removing the seeds from peppers instruct you to slice the chile in half lengthwise, then use a paring knife to remove the seeds and ribs. But, while shadowing in the kitchen of Dirt Candy, I learned an easier way. It's quicker and less risky; plus, it leaves the chile whole (in case you want round, seedless cross sections). 1. Cut off the top of the pepper. 2. Stick a small spoon (a teaspoon or smaller) into the depths of the pepper, turning it around to dislodge the white membrane and the seeds from the pepper's flesh. 3. Spin and scoop, dumping out all of the seeds and membrane that you gather. It's like a treasure hunt! 4. Once your pepper has been emptied, it's yours to use as you please! Slice, dice, and mince away. A (former) student of English, a lover of raisins, a user of comma splices. My spirit animal is an eggplant. I'm probably the person who picked all of the cookie dough out of the cookie dough ice cream. For that, I'm sorry. I like to use a serrated vegetable peeler. The length fits the whole Jalapeno and the serrated side slices right through the membrane. it takes 2 seconds to seed the pepper! This is why I keep a box of disposable plastic gloves in my drawer with the plastic wrap/aluminum foil, etc. (Slicing jalapeños and then taking out your contacts later don't mix...) The gloves also work great when you're peeling and cutting beets too, so you don't end up with pink fingers. You can also take the stem end off the pepper, stand it up, and then slice planks off from tip to table as if you were taking the peel off a lemon for supremes. Leaves the core, ribs, and seeds in one chunk for easy disposal and makes clean, flat strips of pepper. There are many ways to seed a pepper- unless you're particularly susceptible to capsaicin, they all work well in certain situations. This one may work on the watermelon sized hybrids sold in supermarkets as jalapenos, but true jalapenos (as well as serranos and most of the other hot chiles) are really too small to scoop out with a spoon- you can sometimes do something similar with the tip of a knife, but generally it's easier to halve the pepper.